Once the chosen rig is on station, and all equipment and drilling fluid have been prepared, the drilling operation can start. By this point the well engineers would have designed the well and given the drilling crew the design and the procedure to follow. 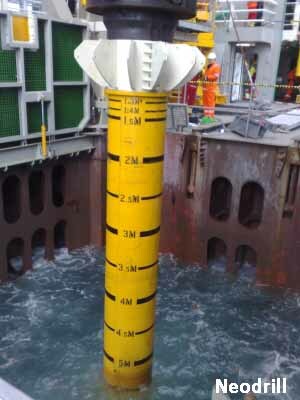 The first step is to ‘Spud’ in a large diameter conductor, typically a 36” steel tube, into the seabed. This conductor will form the top of the well that sits proud of the sea floor. It will provide the casing head-the base for the well head and all well control equipment e.g. the BOP to seal to. The conductor is assembled and lowered to the sea floor by drill pipe attached to the drawworks. Dependent on the composition of the sea floor, be it hard or soft sediment, the conductor can be spudded in in one of two ways. Jetting: Used if the sea bed composition is of soft sediment. Either water or environmentally friendly drill fluid is jetted though the drill bit, moving any sediment up and out the top of the conductor, allowing the conductor to continue further through the sea floor. Hammer: If the composition is a harder makeup, then the conductor will be hammered into the sea floor. Once the conductor has been spudded in, to the depth required as per the well engineers design, drilling will start. The driller will start drilling from the bottom of the conductor going deeper through the sea floor. Drilling fluid typically know as ‘mud’ will be pumped down through the inside of the drill pipe and out through nozzles in the drill bit. This will force any cuttings up and out of the top of the conductor in the same way as in the jetting process. Forcing the cuttings up and out of the bore will keep t the drill string (connected lengths of drill pipe) from getting jammed and keep the bore clean for successive steps. 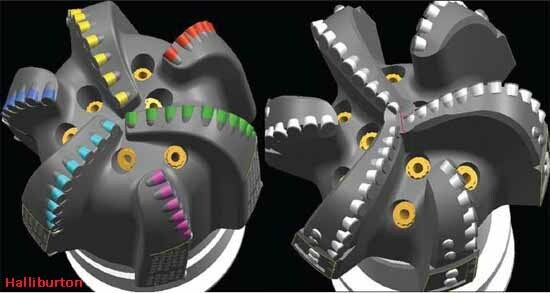 Cool the drill bit, helping prolong its life span. Add pressure to the sides of the well bore, sopping it from collapsing. Counterbalance the force of any hydrocarbons in the well. The greater the force of hydrocarbons, the heavier the mud has to be. In drilling, the mud is often referred to as the first line of defence from a hydrocarbon release or blowout. Once the driller has bored to the required depth on the well engineers plan, the drill string will be pulled out of the well bore, allowing a smaller steel ‘surface’ casing typically around 13 3/8’, to be lowered in to the bore. Cement can then be pumped down into casing until it reaches the bottom of the bore. The pumping will continue pushing the cement out of the bottom of the casing and up between the sides of the casing and the sides of the bore. Once the calculated amount of cement has been pumped, a drillable plug is inserted into the casing, allowing mud to be pumped in order for the cement to continue being pushed out and up the sides of the casing. The cementing operation is continued until the cement has completely sealed the casing in place. At this point, although possibly still a great distance from the target depth and reservoir, the pressure in the well can become too great to control safely by water based drilling fluid / mud alone, also there could be uncertainty about the possibility of hitting unknown pockets of hydrocarbons. Either of these could cause an uncontrolled kick or blowout. 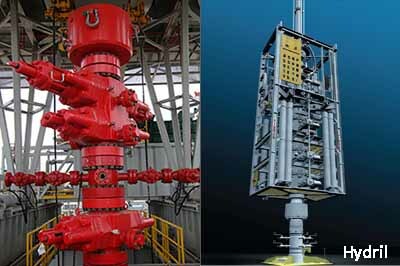 To alleviate this risk, a blowout preventer (BOP) will be installed. This can either be a surface BOP or typically in deepwater drilling operations- a subsea BOP. If needed in a blowout situation, the BOP can shear the drill pipe and seal in the well by a succession of hydraulic rams. The BOP will be lowered and attached to the casing head, at the top of the conductor casing that was originally spudded in. The mud can be cleaned once back at the rig and reused. Having a closed circuit of mud makes it easier for mud engineers and well engineers to assess the composition of the bore. The mud can safely use additional additives to further increase its weight to counteract the risk of a blowout. Most wells drilled today will have a well bore thousands of feet deep. 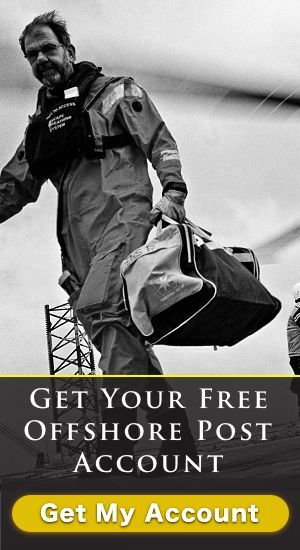 In September 2009, the Deep Water Horizon Semi-submersible drilling rig drilled a well to a record depth of 35,055ft (10,685m). In these circumstances where further drilling is necessary, rather than continue using the same diameter casing, the successive section of well will be drilled at a smaller diameter in order to take the smaller ‘intermediate’ casing. The process will continue by drilling through the drillable plug left over at the bottom of the well from cementing. 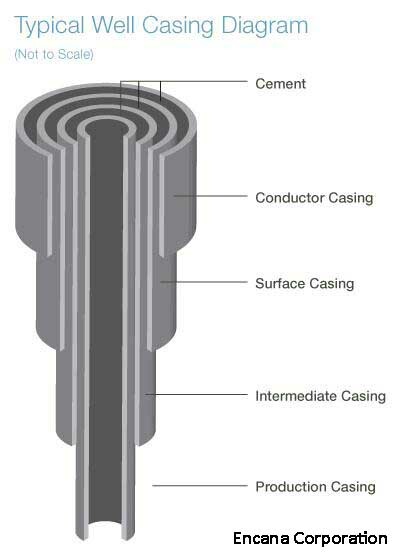 Once the next required depth is reached, the removal of the drill string, and insertion and cementing of the casing will be done as with the surface casing.